PHOENIX (CNS) — Fathers and mothers have the ability and responsibility to lead their families to holiness, wrote Phoenix Bishop Thomas J. Olmsted in an apostolic exhortation. “Over these past 50 years, countless faithful Catholics have surely attained the goal of their lives — eternal salvation,” Bishop Olmsted wrote in his introduction. “Credit here is due to the rich mercy of God, to the dedicated priests and religious who have served our diocese so well, and to you and the many faithful families who have lived — and continue to live — your vocations with generosity and even, at times, heroism,” he said. The bishop recounted his own family upbringing and the role it played in his own vocation. The bishop promulgated the apostolic exhortation as part of the Diocese of Phoenix’s 50th anniversary Jubilee Year of the Family. The special year began Dec. 2 — in 1969 on that date the diocese was established. The document is dated Dec. 30, the feast of the Holy Family. The family — husband, wife and any children they may have — is an image of the Trinity, Bishop Olmsted wrote, citing several recent popes. By its very nature, “your family” is a communion of love and life. The mission of every Christian family, wrote Bishop Olmsted, is to heal and re-evangelize the body of Christ, “so that the light of Christ can shine forth to all peoples.” Part of this is to live a chaste life, which isn’t celibacy, but rather self-control in sexuality so as to will the good of the other. For those who struggle with unchastity and every other vice, the grace and mercy of Christ is readily available, the bishop wrote, as he encourages all to make frequent use of the sacrament of reconciliation. Those blessed with strong marriages are called to evangelize other families in their parish and in the wider community, wrote Bishop Olmsted. He urged couples to find ways to get involved in their parishes or other apostolates. The busyness of daily life can leave families drained and disconnected, he noted, and can lead to difficulty in not being present physically and emotionally. Addictions to technology also can sever the bonds of intimacy and love, he said. “Left alone, even while home together, family members may find themselves turning more and more to shallow entertainment. 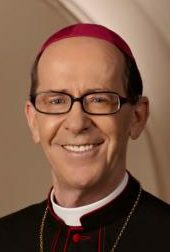 Children and parents are left lonely in their own homes,” wrote Bishop Olmsted. As an example to parents, the bishop pointed to Sts. Louis and Zelie Martin, the parents of five women who entered religious life, including St. Therese of Lisieux, a doctor of the church. Married in 1858, they knew suffering well, he wrote, and they were the first married couple in the history of the church to be canonized together in 2015. The church “gives them to you, mothers and fathers, as witnesses to the joy of the restorative hope of the Resurrection, to the grace to bear the heaviest crosses and to the sanctity of marriage and family life,” he said. Bishop Olmsted offered six guidelines for parents for strengthening family life: keeping holy the Lord’s day; monthly confession; a consistent daily family meal; time spent together as spouses; establishing clear digital boundaries; and consecrating the family home to Mary. He especially encouraged parents to bring their young children to Mass. The bishop encouraged spouses to spend time away together, take part in adoration of the Blessed Sacrament together and participate in an annual weekend retreat. Bishop Olmsted also talked about St. John Paul II as the “pope of the family,” noting he received from his own parents the gift of faith. “For reasons known only to Christ, he has chosen you whom he has joined in marriage to be, at this time in history, an icon of his love for his bride the church,” Bishop Olmsted wrote. Editor’s Note: The full text of Bishop Olmsted’s apostolic exhortation is available in English and Spanish. An accompanying YouTube video can be found here.